You can’t just like comic books– you love them. And if you love comic books, you probably LOVE comic books. But if you’re not into comic books, you’re just not into them. However, for those that aren’t into comic books, it may be hard to understand that they are much more than a collection of short stories intertwined into a longer narrative– they’re much more than just entertainment. Comic books, as we know them in their modern form, emerged onto the scene in the 1930s, just as World War II was beginning. They quickly went from a form of entertainment and an escape from reality, to a source of patriotism, heroic war stories and general pro-Western propaganda– all of which helped keep our troops’ morale as well at the entire Western population engaged, motivated and determined to persevere. Think about the characters that came to be in this early era of comics– Captain America, Batman, Spiderman. These are quintessential American superheros, delivered just when the world needed them most. Encouraging children to adopt good, healthy habits is always tough– eating their vegetables, going to bed at a decent hour, sharing with others. But getting kids to read more, arguably one of the most important habits you can teach them, may actually be very simple– encourage them to read fun comic books, because comic books can help kids learn to read. It’s very simple– humans are creatures of habit. And therefore it’s easier to build the habit of reading into children if the reading is fun and doesn’t feel like a chore to them. Enter comic books– you still follow a story, page by page. If it feels like a book and acts like a book, it’s a book. Eventually they will transition to other types of books as well, but may very well continue to read comic books because, well, they’re awesome. 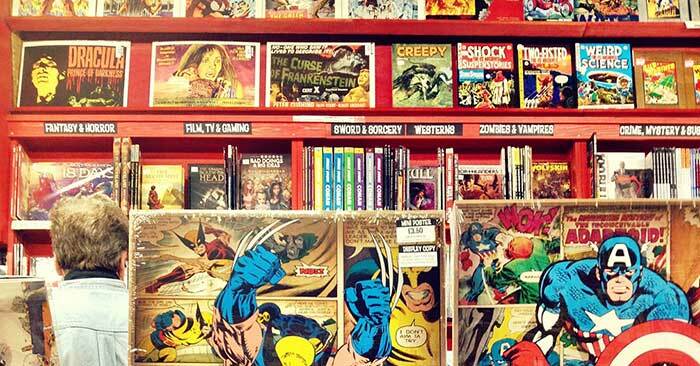 Comic Books can be viewed as an interesting alternative investment, even for people who LOVE comic books. Many specific comic books have rarity as well as a market of willing buyers, so there’s almost always a market for them. Regardless of whether or not you plan on actually enjoying the comic books before selling them, it’s important to understand how to properly value them. Once you understand the dynamics of the comic book market and what specifically gives your comic book collection value, it’s then a lot easier to sell your comic books for the best price possible. As you can see, comic books have it all– educational value, entertainment value, historical value, and of course, monetary value. Remember that Sparkle City Comics is the #1 buyer and seller of comic books, so whether you’re looking to BUY or SELL, we’ve got you covered!